Welcome to Day 9. In this tutorial, we are going to finish up the gameplay by adding collision to the ground and handling death. Then, we are going to implement the score keeping and setup a BitmapFont to display the score! We are picking up exactly where we left off in Day 8. If you want to follow along, feel free to download the source code on that page. We need to add a sound effect for the flapping of wings and another sound effect for scoring a point. Just to be proactive, we are going to add a .font file generated using Hiero. Hiero converts a text file into a .png Texture image similar to the one for our game. It also generates a .fnt configuration file which libGDX can read and figure out where each letter (or TextureRegion) exists. I have generated these files for you to download below. I will show you how to implement them into our game. This font is called: 04b_19. 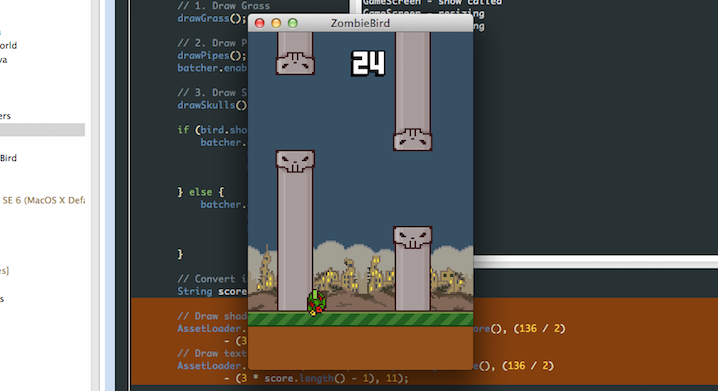 It is used throughout Flappy Bird and is freeware, meaning you can use it for free! I encourage you to open up each of these files and see what they look like! Place all four files inside the assets/data folder in your ZombieGame-android project. We can use this pair of .fnt and .png files to create a BitmapFont object, which allows us to draw Strings to the SpriteBatch in our GameRenderer without creating a new String object each time. 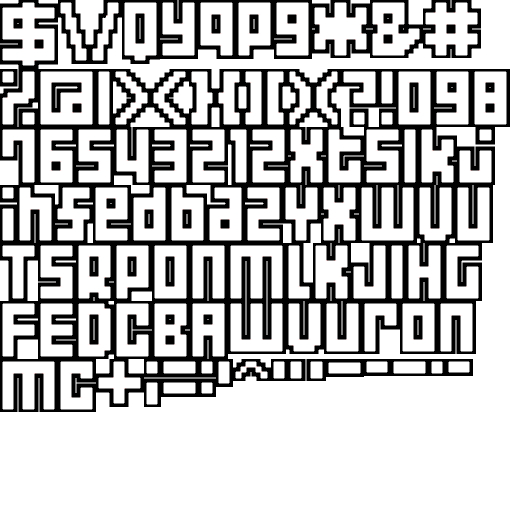 The BitmapFont will use the .fnt file to determine where each letter and number is, so we don't have to do any work! We next move on to the GameWorld class. 1. Begin by deleting the instance variable isAlive. We will be revamping how we handle death. 2. We want our character to die when he hits the ground. We will be implementing this now. Rather than creating a rectangle object representing the collision box for our grass objects and updating them, we are just going to treat the ground as a static box for simplicity. // to update, we will not break our collision detection. Now we must fix our errors in the Bird class. This method will return true if either of the two conditions above are true (meaning that if the bird has a high y velocity or is dead, we will not be flapping). // We want the bird to stop accelerating downwards once it is dead. This is so that if our bird dies while facing upwards, it will point its nose to the ground just like the bird in the game Flappy Bird. The game should now be fully playable with full collision and death. We are now going to implement a scoring system. 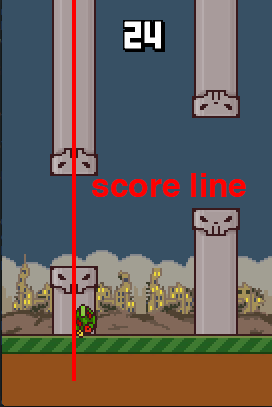 In Flappy Bird, you score a point when your Bird passes about half way thorough each vertical pair of Pipes. We are going to emulate this behavior and keep score. We need to create an integer that keeps track of our current score. We will do this in the GameWorld. The logic for incrementing our score will be in our ScrollHandler class. Let's open it. We need a reference to our GameWorld so that we can change its score. So, we are going to ask for a GameWorld object inside our constructor, and store the passed in parameter as an instance variable called gameWorld. Make sure you import GameWorld (com.kilobolt.GameWorld.GameWorld). - If a pipe's midpoint with respect to x is lesser than bird's beak, we are going to add 1 to our score. - Since we do not want this to repeat, we need to keep a boolean variable for EACH Pipe called isScored. Only if isScored is false, will we add one to the score (Setting isScored to true in the process. If we just need to change isScored back to false when the Pipe resets, then this will work the next time the Pipe returns). 3. We must now move on to our Pipe class and implement our boolean: isScored. This boolean is set to true in the ScrollHandler when a point has been awarded to the player for passing the current Pipe object. You should hear the Coin.wav file play each time that you score a point by passing a pair of Pipes. But we don't want to just hear our score go up. We want to see our score change! So we are going to render some text to the screen for this. A BitmapFont object, as shown above, has a draw method that takes in the current SpriteBatch, a String, and the x and y coordinates to draw the text at. We are first converting the score integer to a String, so that we can draw it using our BitmapFont. We calculate the appropriate X location by checking the length of the score, so that we can center the score as best we can. We now have a working score system and have displayed some text on the screen! In Day 10, we will implement GameStates so that we can handle restarting the game. After that, we will try to add some additional UI!